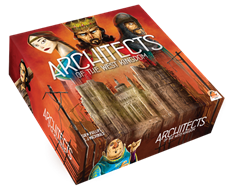 Compete to impress your king and maintain your noble status by constructing various landmarks throughout a newly appointed domain in Architects of the West Kingdom - a unique worker placement game by Garphill Games. Architects of the West Kingdom is set at the end of the Carolingian Empire, circa 850 AD. Players will need to collect raw materials, hire apprentices and keep a watchful eye on their workforce. Throughout the game, players will need to make a lot of moral decisions. However, only at the game’s end will their Virtue be judged. Try the game on Tabletopia and support it on Kickstarter (last hours)!